DOHA, Qatar, 2017-Sep-27 — /Travel PR News/ — Qatar Airways brought its award-winning hospitality and service to the esteemed Rolex Central Park Horse Show in New York City on Wednesday, 20 September, where the airline was a proud sponsor of this year’s Arabian US Open. One of the most highly anticipated equestrian events of the year, the Arabian US Open occurred on the opening night of the fourth annual Rolex Central Park Horse Show. The airline’s cabin crew partook in this year’s opening night events, including presenting champion winners’ trophies and showcasing authentic Arabian hospitality by providing a traditional Arabic coffee service in the VIP Pavilion. The Rolex Central Park Horse Show is held annually at the world-renowned Wollman Rink in New York City’s Central Park. The fourth annual Rolex Central Park Horse Show 2017 featured some of the greatest show jumpers and dressage riders in the world. The Arabian US Open, presented by Aljassimya Farm, was invited back to the event for 2017 and kicked off this year’s programme as the opening night of the show. Qatar Airways was recently the Official Airline Partner of the 2017 Dublin Horse Show and partner of the Qatar Goodwood Festival and, this past spring, flew 50 horses onboard its Qatar Airways Cargo Boeing 777 freighter to Omaha, Nebraska, for the Longines FEI World Cup™ Jumping and FEI World Cup™ Dressage Finals. 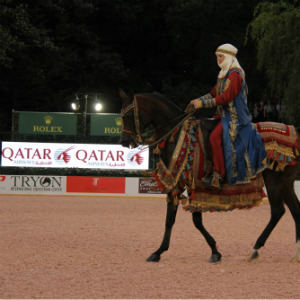 Qatar AIrways Cargo also supports the CHI Al Shaqab equestrian event held in Doha each year. The airline’s cargo service is well-equipped and greatly experienced in transporting horses and their trainers, ensuring world-class treatment and expert handling. Qatar Airways Cargo has seen an upsurge in the past few years in the transportation of horses. In 2016-17, the cargo carrier transported more than 2,300 horses, a 10 per cent increase over 2015-16. Qatar Airways Cargo transports a variety of animals in accordance with International Air Transport Association (IATA) Live Animal Regulations. Qatar Airways has a host of exciting new destinations planned for the remainder of this year and 2018, including Canberra, Australia; Chiang Mai, Thailand and Mombasa, Kenya, to name just a few. The national carrier of the State of Qatar is one of the fastest-growing airlines operating one of the youngest fleets in the world. Now in its twentieth year of operations, Qatar Airways has a modern fleet of 200 aircraft flying to business and leisure destinations across six continents. The award-winning airline has received a number of accolades this year, including Airline of the Year by the prestigious 2017 Skytrax World Airline Awards, which was held at the Paris Air Show. This is the fourth time that Qatar Airways has been given this global recognition. Qatar’s national carrier also won a raft of other major awards at the ceremony, including Best Airline in the Middle East, World’s Best Business Class and World’s Best First Class Airline Lounge. Qatar Airways, the national carrier of the State of Qatar, is celebrating 20 years of Going Places Together with travellers across its more than 150 business and leisure destinations. The world’s fastest growing airline will add a number of exciting new destinations to its growing network in 2017/18, including Dublin, Nice, Skopje, Sarajevo and many more, flying passengers on board its modern fleet of 200 aircraft. Qatar Airways Cargo, the world’s third largest international cargo carrier, serves 60 exclusive freighter destinations worldwide via its world-class Doha hub and also delivers freight to more than 150 key business and leisure destinations globally with 200 aircraft. The Qatar Airways Cargo fleet includes eight Airbus A330 freighters and 12 Boeing 777 freighters. This entry was posted in Airlines, Entertainment, Festivals and Events, Travel Marketing and tagged Arabian US Open, His Excellency Mr. Akbar Al Baker, Qatar Airways, Rolex Central Park Horse Show. Bookmark the permalink.